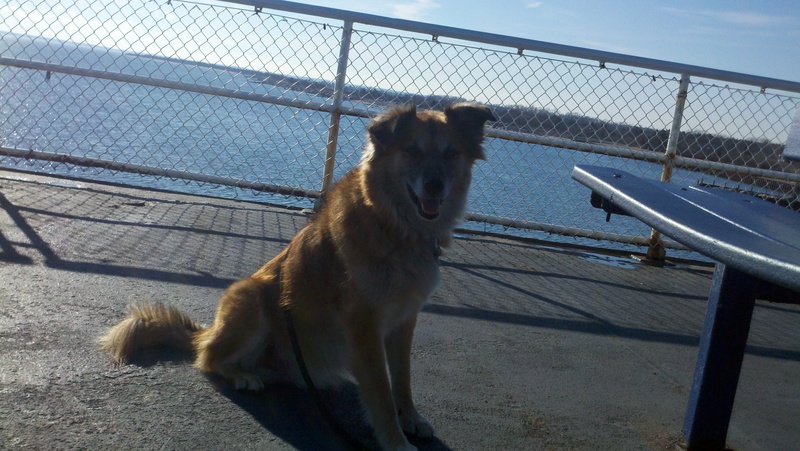 Cross Sound Ferry | Can I Bring the Dog? More of our adventures on the Christmas/New Years giant two-week field trip. 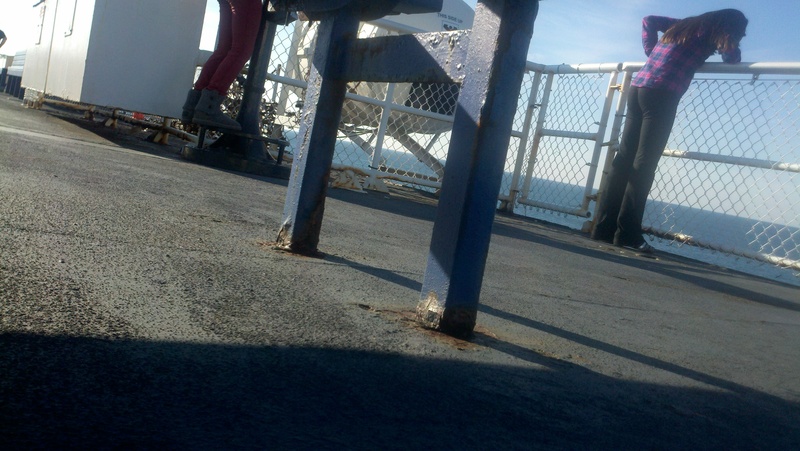 On the way back from East Hampton, I decided to take the ferry from Orient Point, NY to New London, CT, about an hour and twenty minute ride. We arrived in plenty of time on a beautiful New Year’s day. It was about 50 degrees, not a cloud in the sky and not a bit of a breeze. There’s a park/open space across the road from the ferry for a last minute walk, the ferry welcomes dogs, it’s all very accommodating. After driving on and leaving the car, we headed for the top deck and walked around so Chico could sniff and get the lay of the land (as it were) before we settled down on a bench in the sun. Chico is not relaxed yet, he's panting, his eyes and ears are riveted on me, if I even start to take a step he'll be be right at my side in a flash. I applied my best trick for new situations, I settled down in one place and started rewarding Chico for lying near me. Pretty soon Chico was lying down, looking to starboard, and seeing this. Interestingly, nothing about sailing, not the ship's horn or the motion of pulling away from the dock, or having the shoreline change, seemed to upset him. Or maybe he was so overwhelmed by all of it that he couldn't even react. Notice the coin-operated binoculars, they play a part later in the story. About 45 minutes into the trip families started to come up onto the top deck. Two or three family groups with very well mannered children came up to us and one of the kids in each family asked if they could please pet my dog. I always start by thanking them for asking before petting the dog, then I explain that Chico is shy and it’s best if they put out their and and see if he’ll come to them. If they seem confident I can give them one of his treats and show them how to hold it flat in their hand for him (he’s utterly reliable about taking treats gently in this situation); that gets him to pay a little attention to the friendly kid and gives everyone a positive interaction. It got busier and busier, we moved one row of benches in from the walking area, and Chico lay serenely at my feet, gazing out to port and enjoying the occasional cookie. No matter what passed by, he did no more than look to me for reassurance. This is a Chico's eye view of two of the three girls who were playing with the two sets of coin-operated binoculars for a while. They ran, they screamed, they laughed, they had a great time about 7 feet from a Sphinx-like Chico. What a brave Chico. The most amazing interaction was with a little boy, maybe 19 or 20 months old, who came running up behind Chico, pursued (but not quite fast enough) by his tending adult. I saw this all coming out of the corner of my eye and started a steady stream of cookies to Chico. The little tyke came up behind Chico and flopped down on all fours, knees on the deck and little palms smack! on Chico’s hips. Chico barely flinched. * “Oh, honey,” I said calmly and carefully. “You have to be very careful with dogs you don’t know. They aren’t all as friendly as my doggie. You need to ask before you touch a dog you don’t know.” “That’s right,” said the man who came and scooped him up, “you could have come away with a bloody stump.” He seemed to be joking, so I laughed with him, perhaps a little weakly. But, oh my, that was scary. And Chico was a hero. Once my pulse returned to normal things were fine. Pretty soon it was time to start moving towards the car. We moved to the edge of the crowd near the stairs to the cars and I doled out cookies frequently enough to keep Chico’s eyes fixed on my hand. Out of the corner of my eye, I saw a woman and a dog on the deck above us, looking over the flock of folks. She came down to our level and carefully made her way to a spot a good twenty feet from us, also at the edge of the crowd. When I could let my eyes wander from Chico I saw that this person was also engaging her dog and rewarding it for good, attentive behavior. It’s so cool to encounter someone who is working with their dog the same way I am. *Remember, this is the dog that, two years ago, snapped and barked at the vet for trying to lean over him and listen to his heart. In his chart she calls him a “don’t mess with me” dog. This entry was posted in Uncategorized and tagged annie riecken, Chico, desirable behavior, Field Trip. Bookmark the permalink.